She waited for 153 days. 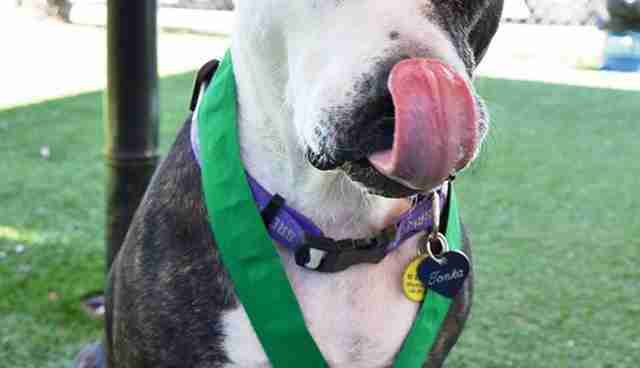 Tonka, a Staffordshire terrier mix, first arrived at the Sacramento SPCA (SSPCA) in California in March. Her owner was homeless and unable to care for her, and decided to give her up to the shelter. The goal, as it is with all shelter dogs, was to find her a new home - but that turned out to be tough, despite her sweet personality. 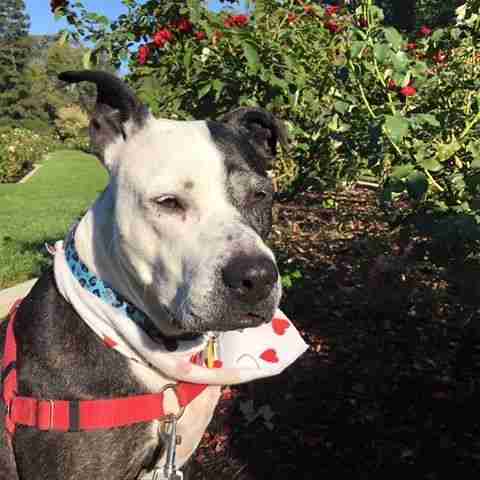 "She had many 'strikes' against her: She's a pittie mix, older at 9 years and didn't 'show' well in the shelter ... She barked a lot while she was in her kennel, which was a turnoff to potential adopters," Sarah Varanini, foster care coordinator at the SSPCA, told The Dodo. "We tried everything we could think of to highlight her. 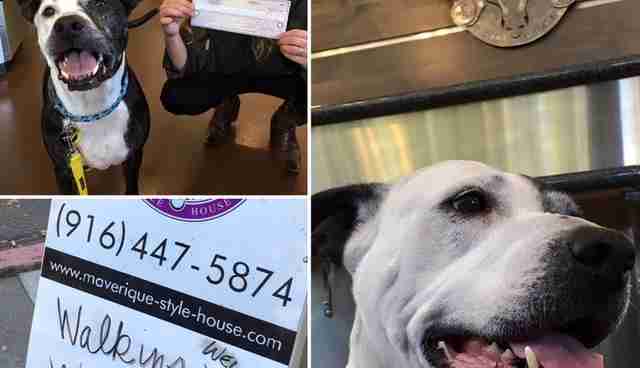 We took her to local television stations, highlighted her on Facebook and had her hang out at the front desk with our staff," she said. There was something else they still hadn't tried. 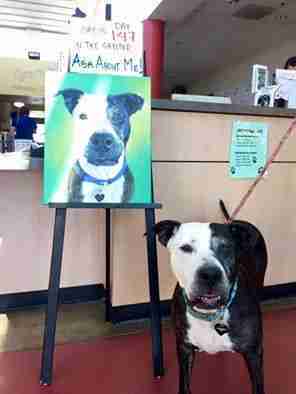 Several other animals who had remained at the SSPCA for far too long had been adopted after they got their portraits painted - so Tonka was made into a work of art. 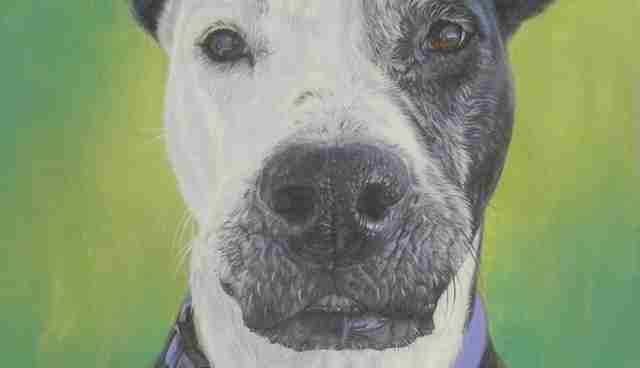 Nathan Cinder, who's worked at the SSPCA for 18 years, has spent the last few years using his personal time to paint portraits of dogs, like Tonka, who've had difficulty finding homes. These "paw-traits" are typically displayed out on the front counter area of the SSPCA - and when the painted pup gets adopted, his or her new family gets to take the artwork home. 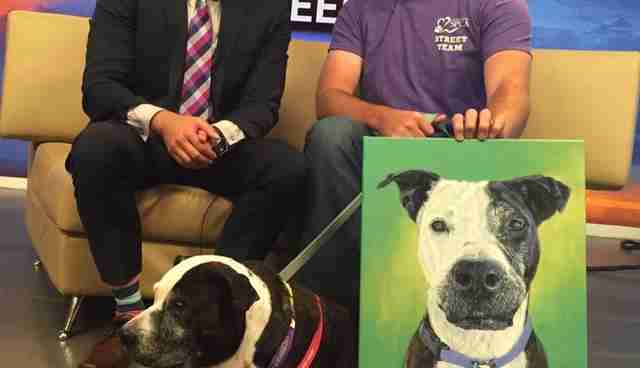 In addition to her painting, on this past National Dog Day, on August 26, Tonka was treated to a special day out and about. Highlights included stopping by Starbucks for a Puppaccino, visiting historic locations in Sacramento, getting a bath at a local groomer before stopping by a salon for a "blow dry" and eating lunch at a vegan restaurant. The day right after her day of adventures, a family came into the shelter, fell in love with her and decided that she was the one. Tonka had spent a total of 153 days at the SSPCA. 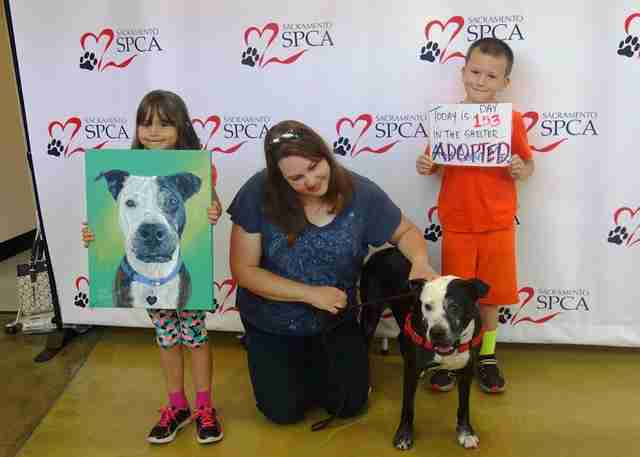 Tonka's victory exit from the SSPCA wouldn't have been complete without one last photo of her, standing proudly with her new family, and, of course, the portrait that helped seal the deal.